The membership of the Moderator’s Department includes representation from the District Association; Moderators, Pastors and Preachers, with enrollment numbers totaling in excess of 750 members across the length and breadth of the Convention. In addition, the Moderator’s Auxiliary is blessed to have a male chorus, “30 Voices”, under the leadership of Dr. Derrick Jones (IL) and Dr. A. Harwell (TN). The chorus consists of Moderators, Pastors and Preachers. The chorus has touched the hearts of the Convention with inspirational singing. The reputation of the Moderator’s Auxiliary is well-know because of the teaching that enlightens, preaching that is exciting, singing that is delighting, fellowship that is inviting, networking that is out reaching, sharing that is far-reaching, praying that up reaches, and love that is showing, glowing and growing. The Moderator’s Auxiliary of the National Baptist Convention USA, Inc. is designed to convene all Moderators, Pastors and Preachers for the purpose of leadership development, doctrinal training, effective evangelism and proclaiming the gospel of Jesus Christ (Matthew 28:19-20). The Moderator’s Auxiliary and the Moderator’s President are accountable to the President of National Baptist Convention, USA, Inc., and it’s Parent Body by being an asset and team player to meet all goals and objectives. The Moderator’s Auxiliary wants to be a positive image by giving back to the districts, colleges and other religious institutions that are making a positive impact in their communities. 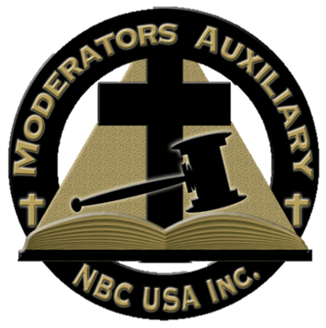 The Moderator’s Auxiliary strives to build stronger districts, members and strengthen our stewardship on the local, district, state and national level. Adapted From: The Moderators of the Baptist General State Convention of Illinois, Inc. (2008). The Moderator’s Handbook…, 2nd Ed. A Moderator is one who is there to serve you in your time of need. Sometimes things might be going too fast at your Church and you need some help to moderate the speed, to reduce the rush of things that might be moving too fast (be it negative or positive). Sometimes you might need the Moderator to reduce the speed of some messy situations so that the situation can bring about some fission in order for some growth to take place. Other times you might need the Moderator to preside over some meetings with an unbiased wise, spiritual and hole mindset to bring harmony to a rough and unstable predicament. Appoint all committees, task forces, and executive committee members. More information will be coming soon about how to obtain a copy of the complete manual: The Moderator's Handbook: Policies and Procedures Manual for the Moderators of the Baptist General State Convention of IL, Inc. Check the Moderators Resources pages for availability.